The cause of those characteristic holes in Swiss cheese has finally been determined – and it only took researchers about 100 years to solve the mystery. 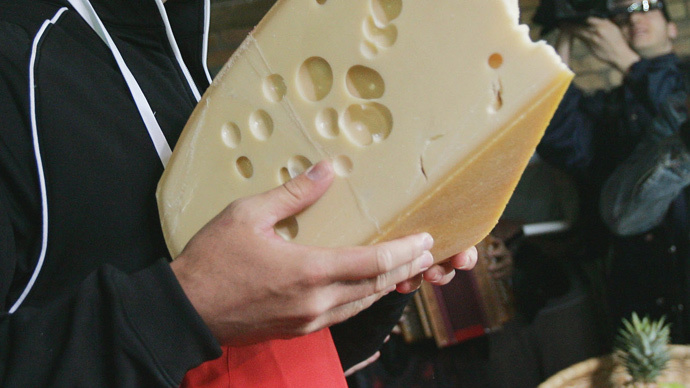 According to scientists from Agroscope – a state-run center for agricultural research in Switzerland – the holes found in cheeses such as Emmental and Appenzell are caused by tiny bits of hay present in the milk used to make the products. In a series of tests, researchers added different amounts of hay dust to the milk and discovered that it allowed them to control the number of holes present. The findings also explain why the holes have been declining over the last 15 years – because the modern technique of milking a cow with a sealed machine has eliminated the possibility of hay creeping into the milk. Simply put, it's the “disappearance of the traditional bucket” used during milking that caused the difference, Agroscope spokesman Regis Nyffeler said, as quoted by AFP. The milking machines “completely did away with the presence of tiny hay particles in the milk,” he added. Agroscope said the issue had been under study since at least 1917, when American William Clark published a detailed study and came to the conclusion that it was caused by carbon dioxide released by bacteria present in the milk. A less scientific – but widely circulated – explanation was that the holes were caused by cheese-loving mice.